This beautiful bathroom has been designed by Stefano Chiocchinni in partnership with stone designers and manufactures Cappellini. Cappellini have been designing and manufacturing in stone, marble and granite for over thirty years. The visual effects of the natural stone is simply stunning. 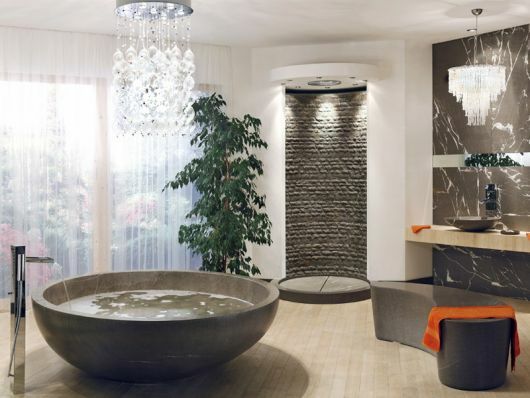 I adore the large circular bath made in natural Piasentina stone. The circular stone theme is continued with the matching basin and the circular structure of the shower wall and base. The natural colours of the stone blend superbly with the white walls and light wooden floor boards. The floaty sheer curtain material adds a slightly feminine touch which compliments the hard surfaces of the stones wonderfully. Being able to catch glimpses of the outside garden makes the bathroom a unique space to relax in. giving the appearance that you are sitting in a private garden! The different textures provide both a great visual stimulus and very tactile bathroom space. The stone work in the shower in contrast to the curtains has a more masculine look to it. The kidney shaped stone bench fit’s the contours of the bath to continue and blend with the circular theme, while providing some very practical seating, complimenting the patterned marble basin back splash perfectly. I also love the lighting! The beautiful glass like, droplets provides a sense of tickling water cascading down the room, while the more traditional style chandelier adds a touch of real glamour. I am totally bowled over with this design! A practical and very useable bathroom space designed for modern living.